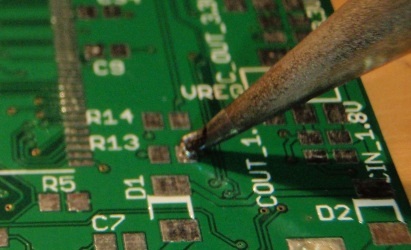 This article covers all those points missing from all the other HOW TO SOLDER articles. 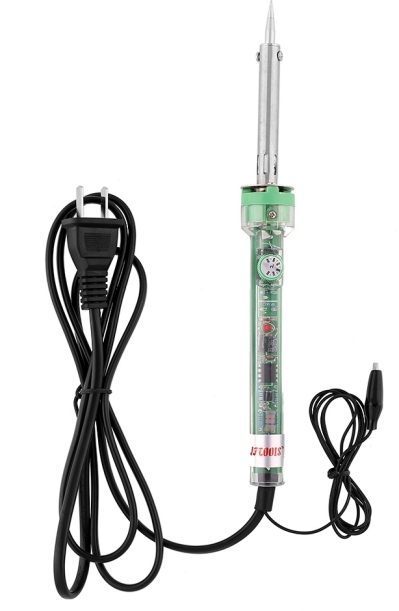 Get the cheapest and best soldering iron from eBay. It costs $12.00 and is temperature-controlled. It is just like a SOLDERING IRON STATION without the high cost. It does EXACTLY the same job and there is absolutely no difference in the quality of the soldering. You can get 110v and 240v versions. The wattage can be 40 watt or 60 watt. For delicate electronic work it does not matter. The actual wattage (heat released by the iron) will be less than 15 watts because it will be turning on and off. 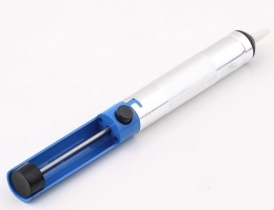 Don't use the following type of soldering iron. It gets too hot. 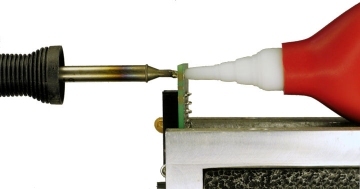 (The rosin burns off too quickly and it leaves a carbon deposit that prevents the solder sticking to the connection.) The tip gets too hot and and it does not stay "clean." 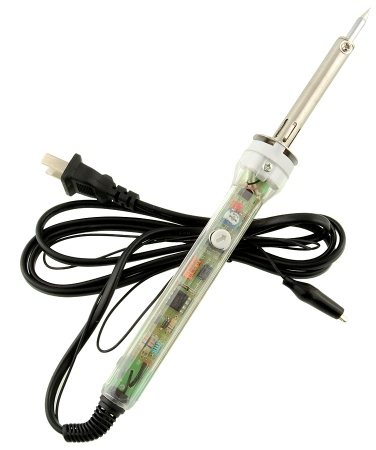 Don't use this type of soldering iron. It gets too hot! Look on eBay for a soldering iron stand. A heavy stand is better than a light stand. The heavier the better. This is the type of stand to get. You can put the copper wire sponge in the tray. 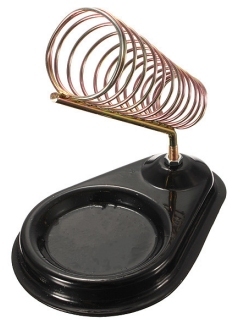 This soldering iron stand comes free with the iron. Don't buy any soldering kit as they only supply cheap HOT SOLDERING IRONS and these are quite unsuitable for electronic work. Wet sponges are quite useless. It just leaves the tip CONTAMINATED. One bunch will last a lifetime. It never wears out. Just shake to solder out of the coils. Make sure the solder is 60/40 or 63/37. It MUST be marked 60/40 or 63/37. Ordinary tin/lead solder WILL NOT WORK. 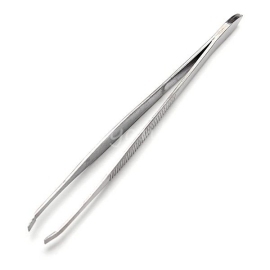 It melts at a high temperature and you will damage delicate electronic components. The solder MUST have flux in the centre of the "wire." 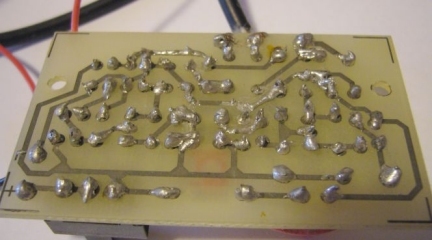 Do NOT buy ACID FLUX solder. It will eat the wires after a few months if you don't wash it off. Do not use 1mm solder. It is too thick. Use 0.8mm solder or 0.6mm or 0.5mm solder. 0.6mm solder or 0.5mm makes the best connections. You will be amazed at how it improves your soldering. 1mm solder is a WASTE OF TIME. It is too thick. It leaves rosin on the joints, It leaves excess solder on the iron and is much harder to use than fine solder. Fine solder will improve your soldering 200% just by being fine. This is something no other soldering manual has mentioned. May be the authors have never soldered in their life !!! 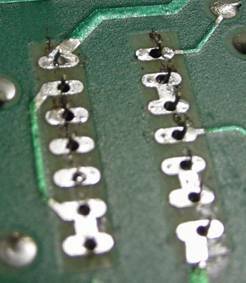 De-solder wick (de-solder braid) is used to "sop up" (remove) solder blobs and shorts and can help remove the solder from the leads of a transistor or IC so the component can be removed from the PC board. The wick contains resin (rosin - the same thing) and the solder flows into the braid and this is how it is removed from the land (component). This process always heats up the component and it may be damaged in the process. Don't pay $3.00 to $5.00 !!! 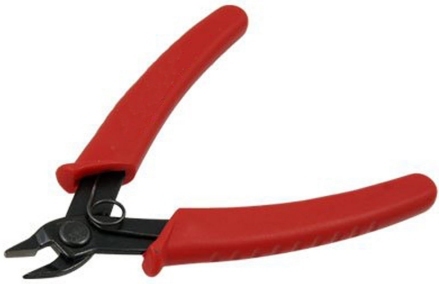 Make sure the side-cutters have a spring to keep them open. 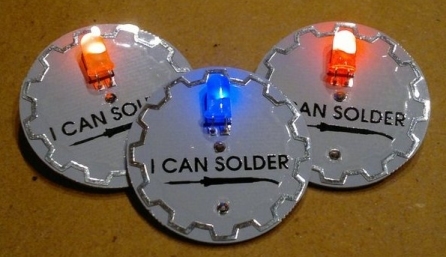 There are two ways to solder. But, what is the correct temperature? Turn the dial to the lowest temperature and switch the iron ON. Touch the solder to the tip - nothing happens. Now turn the temperature up one division and wait a minute. Try the solder again. Keep doing this until the solder melts very slowly. 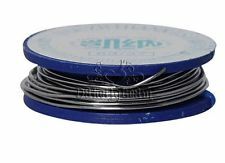 Now increase the temperature 20°C to 30°C (about one division) and you have the perfect temperature for delicate soldering. It will melt the solder quickly but not burn-up the rosin too quickly. You will find the temperate on the dial will be very close to 370°C (700°F). This temperature allows you to remove the enamel from wires and solder very quickly. Increase the temperature slightly by turning the dial above the temperature you used for the example above. Add a small amount of solder to the tip of the iron and place the tip on an enamel-coated piece of wire and touch the bare copper wire end with the tip of the iron to make good conduction. Wait 10 seconds for the enamel to melt. If the enamel does not melt, increase the temperature a small amount and repeat the process. When the enamel melts, you have the correct setting for fast soldering and being able to remove enamel from wires. The temperate on the dial will be very close to 400°C (750°F). Some servicemen increase the temperature further to do VERY QUICK SOLDERING, but this is ONLY for EXPERTS. 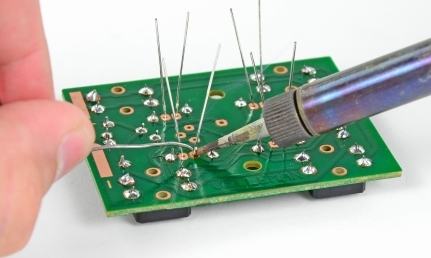 Soldering with a high temperature allows you to make a connection very quickly and the component DOES NOT heat up any more than soldering with a lower temperature. But a soldering iron without temperature control is TOO HOT and it can easily damage the components, especially LEDs, transistors and IC's. 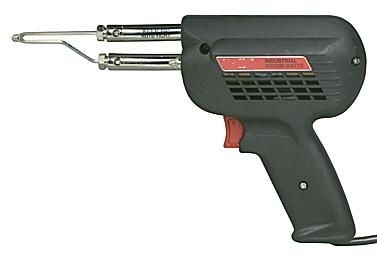 Temperature-controlled soldering irons are SO CHEAP. 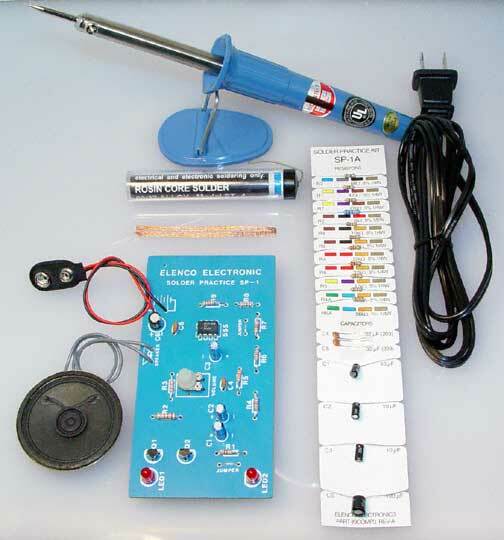 For $12.00 you get an item to take the place of a $240.00 Soldering Iron Station. Soldering is entirely to do with CLEANNESS. Solder will not stick to a dirty wire. It will just "sit there" and the wire can be pulled out. Solder does not clean a wire. It is the resin or rosin in the middle of the solder-wire that cleans the connection. But the resin does not work unless it is heated and melted. When you are soldering, you don't want the solder. YOU WANT THE RESIN. But the life of the resin is only 1 to 3 seconds before it has evaporated. This means you CANNOT transport resin on your iron. By the time the iron has reached the connection, the resin has evaporated. The resin only works when it is heated AT THE PLACE where the connection is to be made. 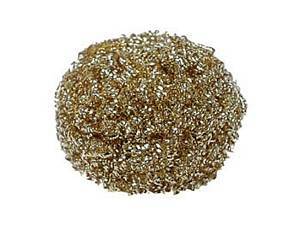 That's why the iron must be as clean as possible by pushing it through the copper-wire ball shown above. 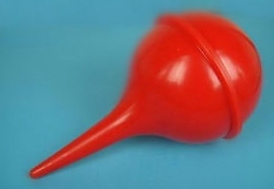 The ball will remove the old solder and clean the tip. Wiping the tip on a wet sponge DOES NOT CLEAN THE TIP. It just leaves a fine film of contamination on the tip that is a result of touching the plastic sponge. 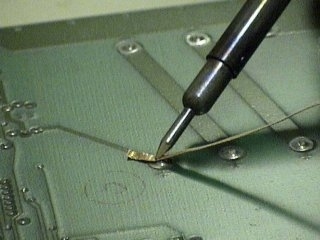 Place the iron on the joint to be soldered and immediately bring 0.8mm or 0.6mm solder to touch the iron from the opposite side of the connection. At the moment you only want the rosin to do its job. Let the rosin melt and clean the components. 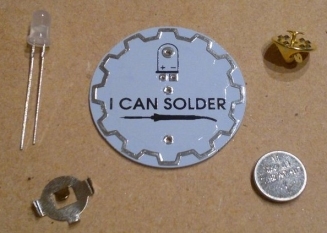 NOW YOU WANT THE SOLDER . . .
Add a little more solder and allow it to run all over the connection and make a smooth and shiny result. Remove the iron and don't move the connection for 3 seconds. 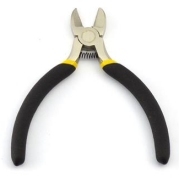 Cut or trim the wire with side-cutters at the point where the wire emerges from the solder. DO NOT cut through the solder and DO NOT cut the wire before soldering. 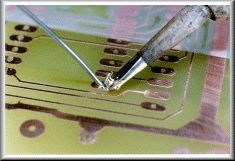 Using 0.5mm solder will prevent excess solder remaining on the joint or on the iron. Since using 0.5mm solder I have never had to remove excess solder from a joint or the iron. That's why a spool of 0.5mm solder lasts much longer than 1mm solder. There is no wastage ! 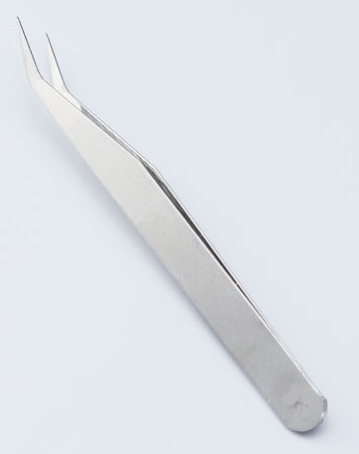 The tweezers can be straight or bent. Use the iron to melt the solder that is already on the land and this will keep the resistor in place. Make sure the resistor is flat against the PC board by lightly pressing on it and slowly re-melting the solder if it is tilted or out of alignment. Make sure the resistor is square with the sides of the board and exactly aligned on the lands. Now solder the other pad. You can re-solder the first pad again and add a small amount of solder to make a good connection. Here are some messy joints. If you follow our guidelines, you will not finish up with faulty connections. This is not very good soldering. If you use 0.5mm solder, the joints will improve 200%. don't see the bare tracks (called traces). Here are some good soldering joints made with a cheap "hot"
soldering iron. You can see the barrel has got too hot. you work quickly and keep the tip clean. This diagram shows the wrong way to add solder to a connection. Never add solder to the iron. The flux just burns off and is wasted. push the solder towards the iron to get it to melt. I don't like "screwdriver" tips. The image shows the iron ready to place a SMALL amount of solder on one of the lands, for the Power Transistor. 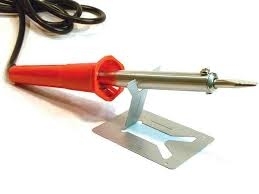 Use a soldering iron with a "pointy tip" (conical tip). A "screwdriver tip (chisel tip) is not ideal for fine electronic work. Only a "point tip" will allow you to solder all types of fine connections. Place the transistor on the lands and hold it in place with tweezers while re-heating the solder. This will prevent the transistor moving. Make sure it is touching the PC board. Solder all the "legs" ( pins) and "tab." Re-solder the first leg to make sure it is fully soldered. See the excess solder on the iron. 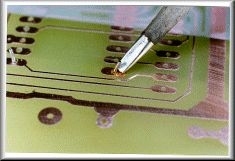 He has not used very fine 0.5mm solder !!!! Holding a Surface Mount transistor while soldering the first leg. in place. The other two legs can now be soldered. The photo shows a clip used as a heatsink to prevent damaging the LED. 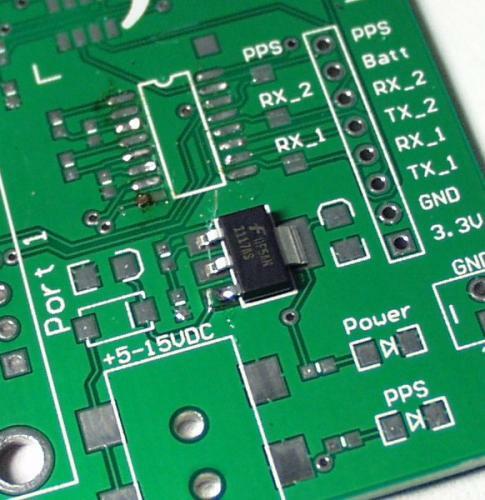 If you follow this article and use a temperature-controlled soldering iron and 0.5mm solder, you will not need to use a heatsink as the joint will be soldered quickly. 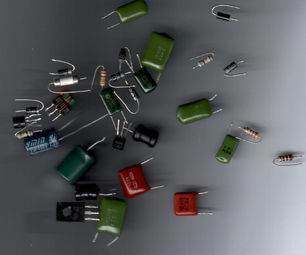 If you every damage a transistor or LED, you are taking too long. You should not produce blobs and shorts when soldering if you use the method we have described above. 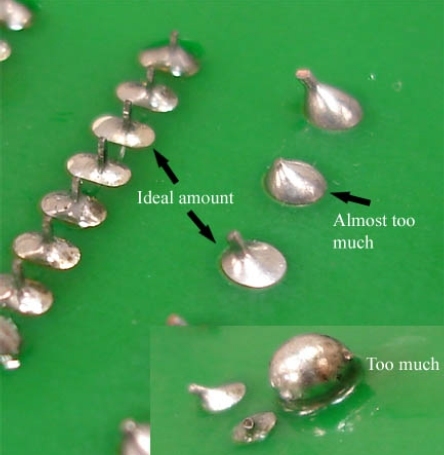 It is virtually IMPOSSIBLE to leave too much solder on a joint if you use 0.5mm solder. However a blocked hole will prevent fitting a through-hole component and the hole must be unblocked. The quickest and easiest way is to heat the hole (the land around the hole is called the doughnut or pad) with the tip of the iron inside the hole. Immediately take the board away and tap it as strongly as possible on the bench. The solder will fly out of the hole. This is especially a problem if the hole is "plate-through." 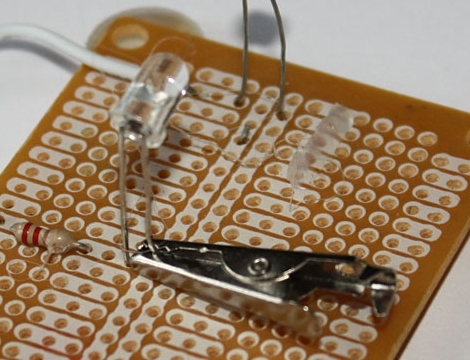 If the hole is on a single-sided board, you can use DE-SOLDER WICK. Sometimes you can remove the solder from a plate-through hole and remove the component. 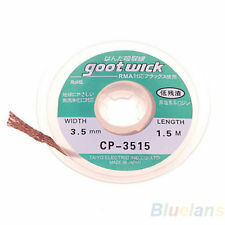 It depends on the size of the hole and the thickness of the wire. Sometimes you can get rid of most of the solder and pull the lead when the iron is re-heating the joint. 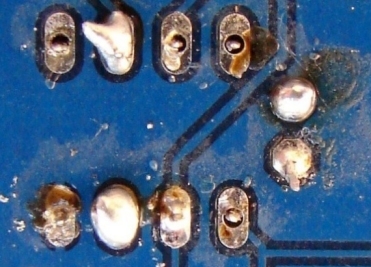 The solder was removed from the 14 pins with solder wick. easily lift off the board if overheated. Another method is to use a DESOLDER BULB. These are expensive and the cheap ones don't work because the hole is not large enough. You can also use a solder sucker. This costs only $2.00 and works quite well. Using and Soldering SURFACE MOUNT components is quicker, cleaner, easier and more rewarding than soldering through-hole components. As soon as you agree, you have mastered SURFACE MOUNT. 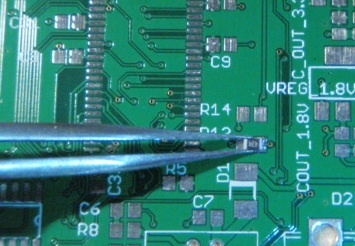 The art of desoldering is just as important as soldering. 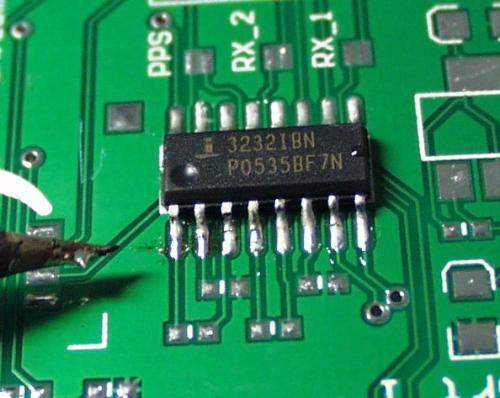 There are many times when you will want to remove a component from a PC board without causing any damage. If you heat the component too much, pull it too hard or wiggle it too much, the track will be damaged. 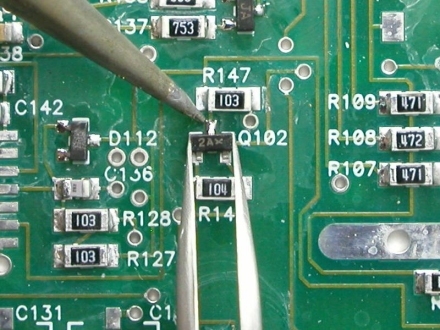 Removing a component from a double-sided board that has vias from one side to the other is slightly more difficult as the hole remains filled with solder. The fastest way to remove a component is to connect a hook and rubber band and pull on the component while heating both leads at the same time. A loop of string is better as it wont sent the part flying off. If you are very clever, you can pull on the component while holding the board and heat the leads. This way you don't need any help from a hook or string. If you want to fit another component in the same holes, you will need to remove the solder from the holes. This is done by poking the tip of the iron into the hole and making sure the solder has melted. 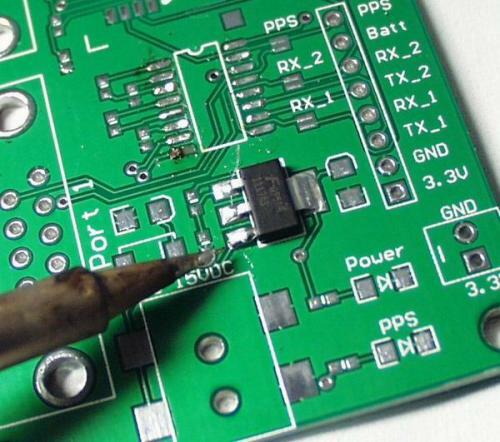 Now, IMMEDIATELY tap the board on a hard surface and the solder will fly out of the hole. Any remaining solder can be poked with a pin as the pin will not attract the solder. Multi-leaded components such as IC's and sockets need expensive solder-pots or hot air guns as you cannot get to all the pins quick enough. A 3-leaded transistor is about as far as you can go. 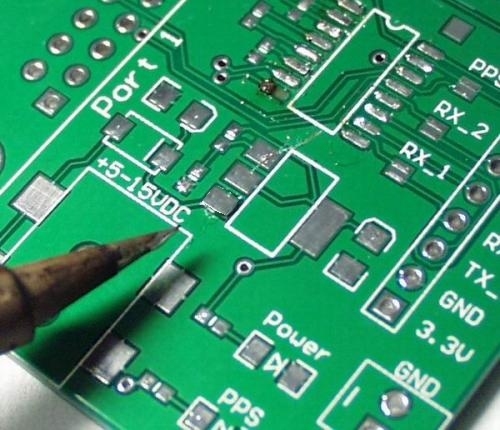 Practice on JUNK boards before working on something you cannot afford to damage and you will be ready for the total field of SOLDERING and DESOLDERING.